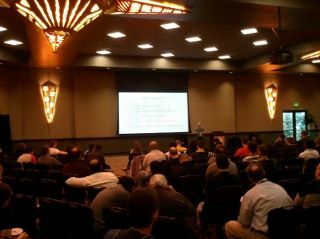 Last week was CodeMash 2012. This was the seventh iteration of the conference and the first time I’ve been back since the first year. If there is one thing that I can attest to, having missed the 5 years in between, this conference has gotten a lot bigger. To put things in perspective (since I don’t have the actual number of attendees from 2007), CodeMash 2007 (the first year) cost $35,082.83. This year (2012), they spent $22,400 on BACON! I only wish I could spend this much on pig. This year there were roughly 1200 attendees and 130 speakers. Thankfully, after submitting a few different session abstracts, I was chosen to speak on an Introduction to Android Development. While I wasn’t really prepared to speak on the topic when I was accepted, in-between then and the conference, I wrote my 31 Days of Android series. After having written that, I was more than prepared to create the presentation and speak about it confidently. I was still a little nervous as this would be the largest crowd of people (that I didn’t already know) that I would be speaking to. That said, things went pretty well. I had one of the largest rooms at the Kalahari conference center (outside of the ballrooms). While it wasn’t jam packed, I’d say there were probably about 100 people give or take a few. My talk did run a little too long on the slides and I didn’t have quite enough time to walk through a demo (which was mostly going to consist of some very basic Android stuff). However, I received a lot of positive feedback after the presentation and was able to hang out afterwards and answer some great questions from some of the attendees. I’m really happy I was accepted and was able to talk at the conference and I hope to be able to speak at future CodeMash conferences. You can download the slides from my presentation here. As always, if you have any feedback or questions, please let me know. Thanks, great review to the important points. Some really great thoughts here, very comprehensive. I appriciate that!Keep this nice writing continue.